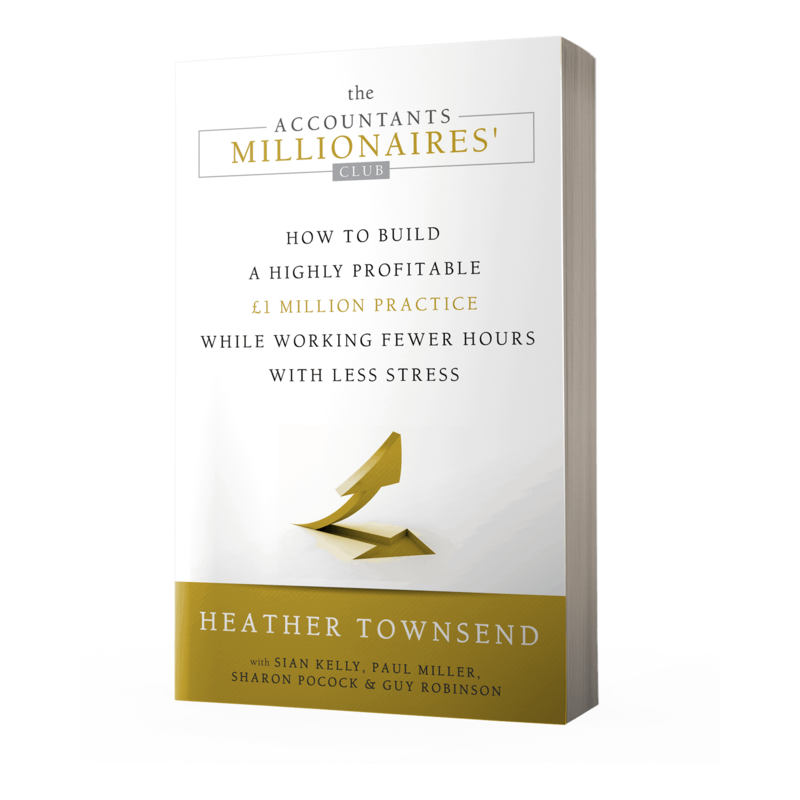 The Accountants Millionaires’ Club, led by Heather Townsend, is a community, set of tools and resources for accountancy firm owners. If you’re breaking six figures and looking to profitably scale to the magic million pound mark, then The Accountants Millionaires’ Club is designed, specifically, for you. What would it mean to you if you could build a £1m practice while working fewer hours with less stress? Could you finally realise your dream of being financially free? Would you now have peace of mind that your pension and a comfortable retirement was now sorted? Or perhaps you could finally prove to yourself that you could become a one million pound practice? Whatever your reasons, download your free copy of The Accountants Millionaires’ Club book. Why is it so difficult to grow a one million pound accounting practice? Once you’ve mastered the art of winning clients the early days of growing an accounting practice are relatively easy. However, the troubles start when you need to employ staff within your practice. In fact, when you get your practice to over £100,000 in turnover it can often feel that for every step forward you take two steps back. This is because you have entered the “work in/work out” trap – which every firm needs to get through. Growing your accounting practice normally means long hours, high levels of stress and balancing your personal income requirements with keeping enough cash in the business to invest in growth. The irony is you probably started your practice because you didn’t want to be tied to a corporate job, and wanted the freedom of being your own boss. You had grand ambitions to become your clients’ trusted advisor. So, how come you’ve got bogged down with the day-to-day compliance work of needy, low fee paying clients? What you need to be a One Million Pound accounting practice? To grow your accounting practice you need to firstly get to the starting gate. This means having a strong personal reason to grow your firm, backed up by a winning vision and roadmap for how you are going to get there. Once you have found the time to implement your vision, its time to build a firm foundation for growth. To create a firm foundation for growth you need to get yourself out of the dreaded “work in/work out” trap, build an efficient operation, create cash reserves, get the right people doing the right things right. When this is all in place you can get your team in place to deliver the day-to-day stuff but also execute your planned strategy for growth. Only when you’ve established a firm foundation for growth can you scale up your practice. This means creating a suite of highly profitable services, such as advisory, which clients are desperate to buy and a stream of leads which allow you to scale predictably without the anguish of over-trading. The Accountants Millionaires’ Club is a community and set of tools, regular events and resources to help you scale up your practice to one million pounds and beyond. If you join the club you will learn from industry leading expert Heather Townsend and her hand-picked advisory board members, who have all built industry-leading and award-winning cloud based practices. Every month you will be invited to participate in a series of events. These could be a surgery session where you are learning from a member who has been there AND got the teeshirt, or a member spotlight where you could listen into coaching session with a member on a particular issue or problem. Or it could be a 3-4 month mini-training programme run by the club experts for club members. For a full list of membership benefits see here. But the club’s events are not just for you the practice owner. You can invite your team members to all the club events – just not the group coaching calls. Our club members know the power of accountability to get things done. You know and I know that it’s easy to get sucked back into your comfort zone and do what you’ve always done. That is why every fortnight you will be invited to participate in an accountability group call to share your progress, solve your challenges, learn from your peers and be publicly accountability to what you want to achieve over the next fortnight. And finally, we know you don’t want to reinvent the wheel as your grow your practice. This is why your membership includes a suite of downloadable resources which you can plug and play into your own practice. The resources include stuff like Xero training manuals for your staff and client, ready made Xero training sessions for clients, tried and tested process maps to automate the onboarding for your clients, electronic workbook for year end accounts production to mimimise overwork and duplication of effort… and much, much more. Here is a list of the current resources which you will get access to as a member of the club. Before I started working with Heather I had what I would describe as a magpie tendency in that I went from one new idea to another without implementing any of them properly. Working with Heather has curbed me of this and as a result I have added over £100k of recurring fees to my portfolio, stopped the profit drain and quadrupled or more my net profit. After 20 years of running a practice I’ve never been more energised or focused (and confident) to grow a million pound practice. It is in sight now and I know that I will get there within 5 years with Heather’s support and guidance. Members of the club all share one purpose, to profitably scale up their practice so that it annually turns over £1 million with a net profit margin of 40%+. Club members are committed to growing their firm and realise this is not a “get rich quick scheme”. Members know that scaling their practice will take time and effort, and at times will take them out of their comfort zone. Then we have over 20% of our members who are their firm’s “succession plan”. They have joined the club to take over from the present owner of the firm who wants to hand over their firm to someone who is ready and able to lead and manage the practice. And finally we have firms who are doing well but want to increase their average client fee and the sustainability of their firm by adding in advisory revenue into their firm.